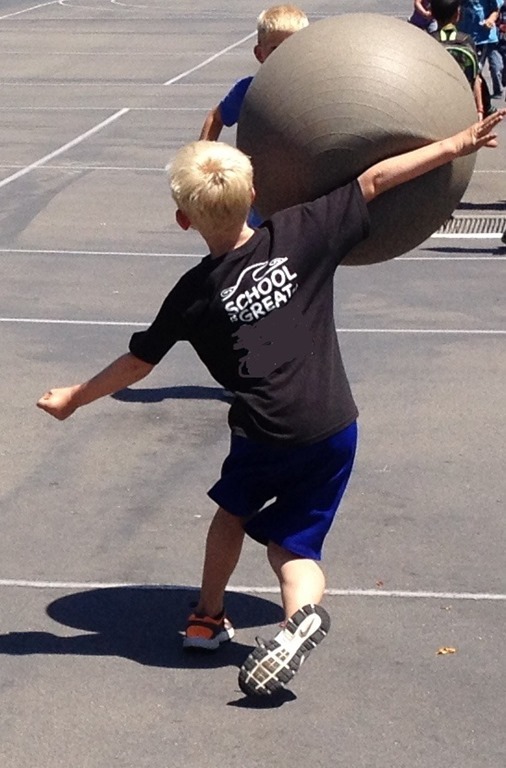 My first-grade son’s favorite game is foursquare. In fact, I’m pretty sure foursquare is the number one reason he enjoys school. At snack recess, lunch recess, and for as long as I’ll let him play after school, he’s out there joyfully slamming balls into the asphalt. He and his friends get pretty heated about their foursquare. Controversy invariably ensues about who exactly is out, with impassioned references to such obscure terms as “linies,” “set-ups,” “inners” and “wars.” One term that even I understand is the “do-over.” When the conflict seems unresolvable, they agree on a do-over and start the play again from the beginning. I find the do-over a pretty appealing (not to mention Christian) concept–you know, the fact that as badly as we sometimes mess things up the first time, somehow, miraculously, we get offered another chance. Happily, it seems to me we get a lot of do-overs in parenting. All of those things that we have to repeat (seemingly) one million times—the diaper changes, the messes we clean up, the feedings, the making of the lunches, the washing of the dishes—another way to view them is as repeated do-overs, as so many chances and opportunities to get it right. I wish I could say that I changed every diaper, tied every shoe, and prepared every school lunch with a full sense of the meaningfulness of the task, the privilege of caring for my child and appreciation for the gift of my child in the first place. But the truth is a lot of the time I do that stuff with a sigh, a sense of checking off one more thing on my to-do list or even a sense of resentment that I am the one stuck doing it again. When I catch myself doing this, I try to remind myself to do it better the next time. At a recent spiritual formation conference I attended, Chris Hall said that the Christian life is full of repeated chances to love each other like Jesus. We love each other, or we try to, and even when we fail, we get up again the next day and we try again. I like this way of looking the Christian life. Each time I begin another one of those repeated tasks, it’s nice to think of it as another chance I get to love my children and my family like Jesus does, to find some meaning in a small act of service. One more chance to demonstrate the patience and kindness that I always want to demonstrate. Another chance to appreciate, to care lovingly with the servant heart I am trying to cultivate. Another chance to be the parent I was created to be. This is what I like to pray each night with God. Help me to be the mom, the person, you created me to be. And with God’s help I do believe I am making progress, be it slow and incremental, into becoming more and more formed into that person, a person more like Jesus than the person I was yesterday or the day before that. Still, I’m grateful for the many chances I get to be better, not least because I know there’s a finite number of them, not matter how infinite the job seems at the time. So when I feel like I’m making that school lunch or trying that shoe or supervising that bath for the millionth time, I try to view it as the blessed opportunity to get it right, to do it with the love and care I want to give it, or at least to do it better than the time before. Because just when it seems like I will lose my mind if I have to tie that shoelace one more time, my son will finally get it himself. And want to take his own shower. And want to buy the school lunch. One day, or so I hear, we’ll look back with such fondness on the diapers and the shoelaces and the messes, as hard as that can be to fathom when we’re in the middle of it. But I hope not to have any regrets about not seizing each of these opportunities as they continue to present themselves. Thank you, God, for the do-over. Tags: children, do-over, family, foursquare, kids, parenting. Bookmark the permalink.